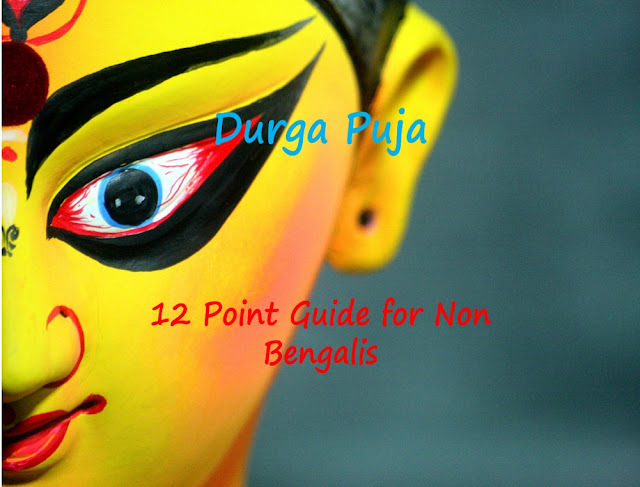 One of the largest festivals in India is Durga Puja. To give you a scale of the event - You can take the craze of Christmas in London, Summer Carnival in Rio de Janeiro, Valentine's day in Paris and then add it to the month-long madness of Olympic Games or the World Cup and cram all that into a span of 5 days and you still wouldn't know what you are missing if you haven't been in Kolkata during Durga Puja. This can throw a glimpse at the grandeur and magnificence of the festival, but you will not be familiar with this festival until and unless you visit the City of Joy- Kolkata. 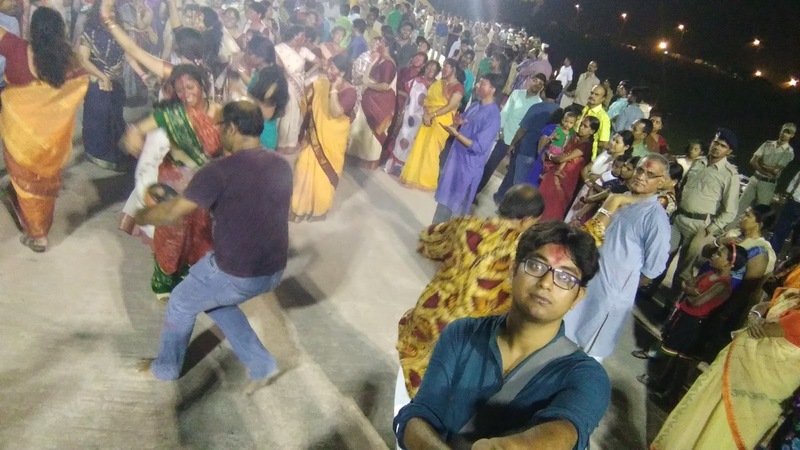 Bengalis across the world start making plans at least 2-3 months prior to Durga Puja on what they would be doing in the 5 days of festivities. 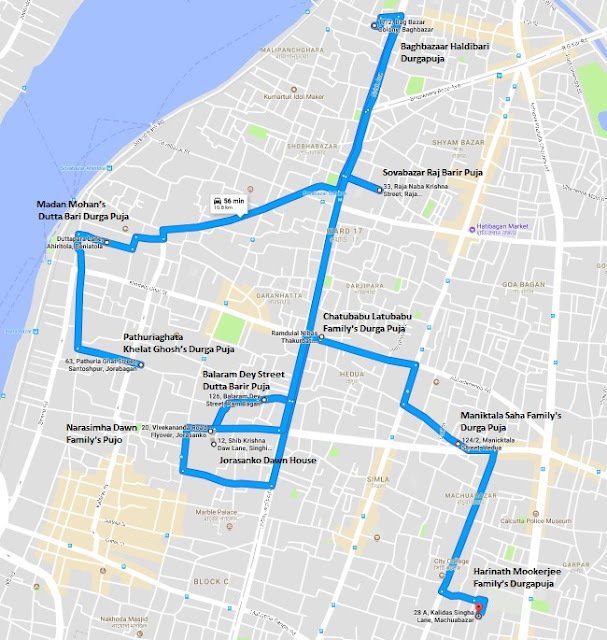 For a person who is visiting Kolkata during the festival for the first time, it might be very confusing as there are so much to do in such a little time. 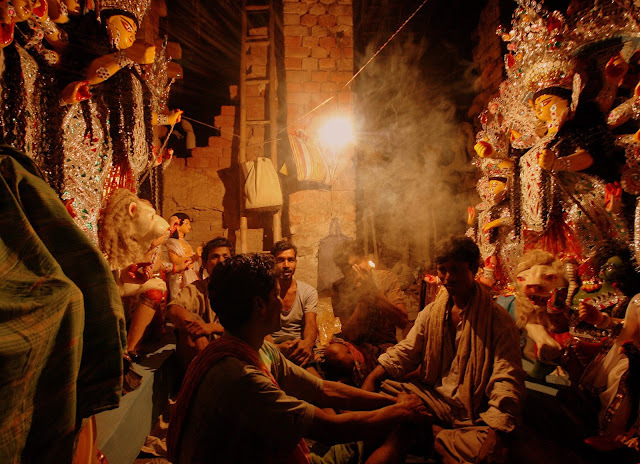 It's a must do to wake up at 4 am on Mahalaya morning and tune in the radio to listen to Mahishasura Mardini in the voice of Birendra Kishore Bhadra. Since early days, Mahalaya is started with a morning two-hour radio program named Mahishasura Mardini (The Annihilation of the Demon). In earlier days, the broadcast was conducted live however we now hear a recorded version. Bengalis wake up early morning at 4 am to listen to the voice of late Birendra Krishna Bhadra and Pankaj Kumar Mullick on AIR (All India Radio). The radio program recites hymns from the scriptures from the Chandi Path/Kavya (Devi Mahatmyam). The audio montage of the recitation is followed up by devotional Bengali songs, classical music, and melodrama. After hearing Mahishasura Mardini head to Babughat or Mullick Ghat in Howrah on Mahalaya morning. You will see lots of people who have gone there to offer the puja to their deceased ancestors. There is a different energy altogether. It is called Tarpan and it involves taking a dip in the Ganges and offering its holy water to the souls of forefathers and praying for their peace. When in Kolkata during the Durga Puja and not going to Kumartuli to watch how the Durga idols are made is a sin. 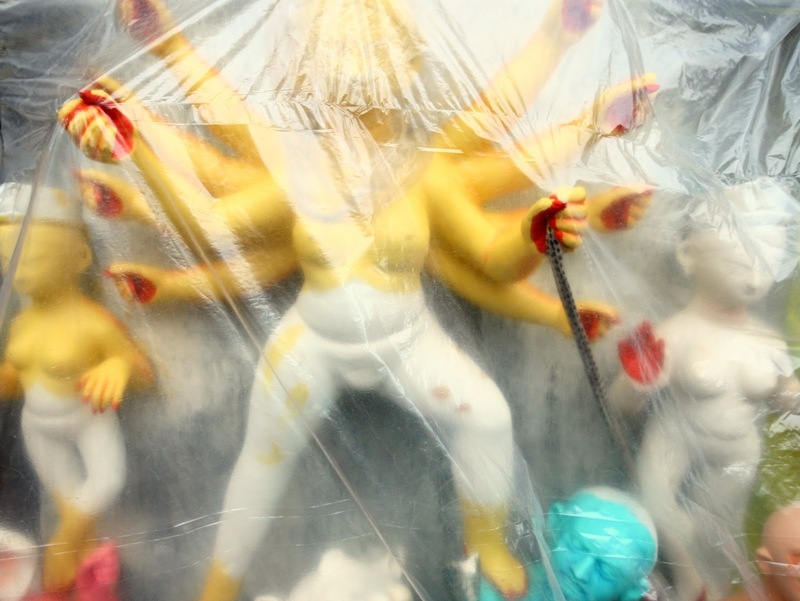 Head to Kumartuli which is near Sovabazar to watch how the Durga Idols are made. The artisans at Kumartuli give shape to clay to make beautiful Durga idols which are exported across the world. The craftsmanship of Durga Idol is worth viewing. 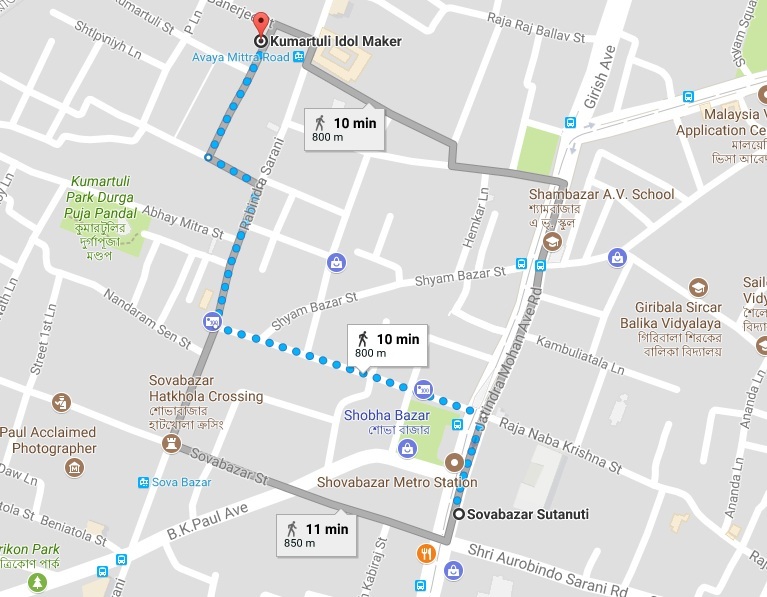 Go to Sovabazar Metro station ( you can either take a metro or a local transport) and walk for just 10-15mins to reach Kumartuli. If you are planning to take photographs you need to buy a Photography Pass which will cost you Rs 50(approx $1). Please respect the idol makers and don't try to click photographs from obscure angles as trying to do so you might damage the idols unknowingly. 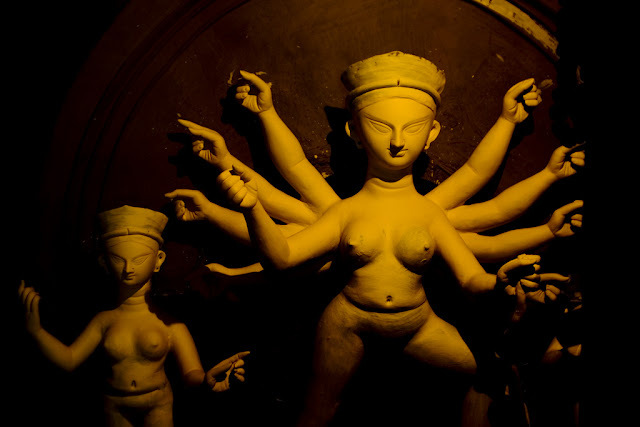 Kumartuli has a different energy and feels completely charismatic just 5-6 days before Durga Puja when idols are taken from Kumartuli to various parts of the city. The way the labors move the huge idols from the artisan's workshop to the truck is worth seeing. It's a science in itself. 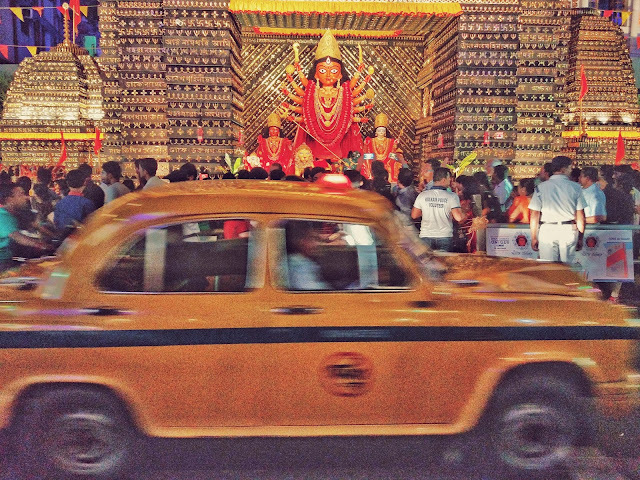 It's worth going to Kumartuli 5-6 days before Durga Puja after sunset. If you go in the morning you will find a sleepy Kumartuli and in the evening you will find Kumartuli bustling with energy and people as the Durga idols are readied to be taken to the respective pandals. During Durga Puja is an absolute must to do pandal hopping at night. During the night the entire city of Kolkata looks like New York Times Square. The entire city is filled with light and the lights are used in very innovative ways. You will find forms and figures made with LED lights. Millions of people come out on the street wearing their new and trendy clothes. The people go from Pandal to Pandal to view the innovations which have been made. There are contests hosted by the big brands to judge the best pandal, best Durga idol and other categories. 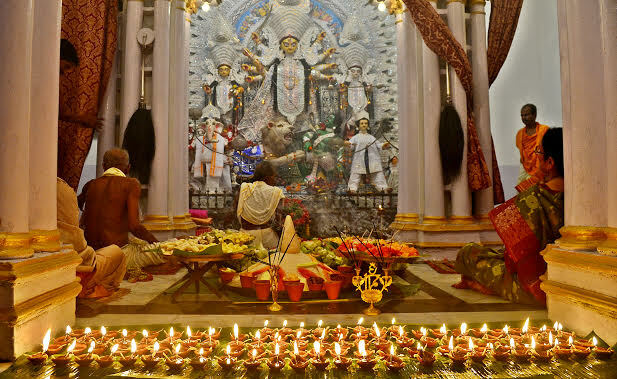 In Kolkata you will find two kinds of Puja: Theme-Based Puja ( these are public puja) and Barir Puja (means puja at one's own house). These pujas follow the rituals strictly and is only attended by the people of the house. During earlier colonial days the Durga puja was an affair for the rich and thus it was restricted to the zamindars. There are Durga pujas in Kolkata which has been strictly following the rituals for 100s/200s/300s years and are still done at the ancestral homes of the zamindars.These pujas are called as Bonedi Bari Durga puja. You should not only visit at least few Bonedi Bari Durga puja to get a feel of the authentic puja and the rituals but also to see the architectural beauty of these zamindar houses. The zamindar houses open the access to the public during Durga puja which otherwise remains restricted. The following Bonedi Bari Durga Puja is my personal favorite and a must visit. If you love food then you must try the bhog on Ashtami. Bhog is basically the prasad which is offered to goddess Durga( Prasad: A devotional offering made to a god, typically consisting of food that is later shared among devotees.) The bhog of Ashtami is a simple one with khichdi, few fries, vegetables however the taste of the bhog is very unique which you will only get during the Durga puja. Even if you prepare the bhog exactly with the same ingredients after puja you will not get the same taste. Head to any nearby puja pandal during the noon and ask for bhog prasad. The people will be happy to hand over a plate of bhog for you to taste. Sandhi Puja is done during Durga Puja at the junction time of Ashtami(8th day) and Nabami(9th day).This is a very powerful puja in the entire Durga Puja which happens over 4 days..Goddess Durga is worshipped as Devi Chamunda during Sandhi-Puja lasting about 48 minutes (comprising 24 minutes of Ashtami and 24 minutes of Nabami). During the battle against the Demons, the Goddess appeared as Devi Chamunda and had slayed the demons Chando and Mundo – the generals of Mahishashura, who attacked her from behind. And the moment of this great slaying is reckoned as the moment or Sandhi-khan. During the sandhi puja, 108 lamps are lighted along with 108 lotus flowers. The pandals with 108 lighted lamps and 108 lotus flowers look beautiful and it's worth watching the entire Puja. Dhunachi Nach. 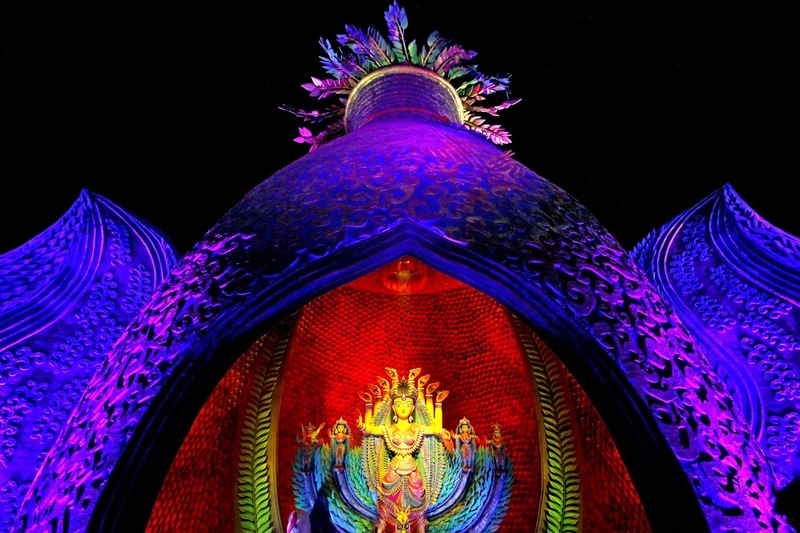 This kind of dance art is performed during Durga Puja wherein the performer carries a flame(called as dhunachi with coconut).The dhunachi is an earthen pot with a huge cavity which is filled up with coconut and is lighted up and incense is sprinkled on it. During Durga puja and especially on Navami night dhunachi nritya/nach is performed in front of goddess Durga. The dhunachi nach is a frenzied dance which is performed to the beats of dhaak.Many pujas organize a contest for best dance performers. There are no particular steps for dhuanci nach. Suggest you pick up dhunachi and dance to the tune of the dhaak. One of the most important and the best thing to do during Durga puja is to savor the awesome street foods Kolkata has to offer. Thousands of fast food makeshift shops open up during the durga puja across Kolkata. The shops might look unhygienic but soon you will get confidence on the hygiene factor when you will find lots of people heading to this shops to have a quick bite. Don't forget to have puchka , roll, muglai while on a pandal hopping spree. On the last day of Durga Puja, the married women go to the pandal to bid adieu to goddess Durga. 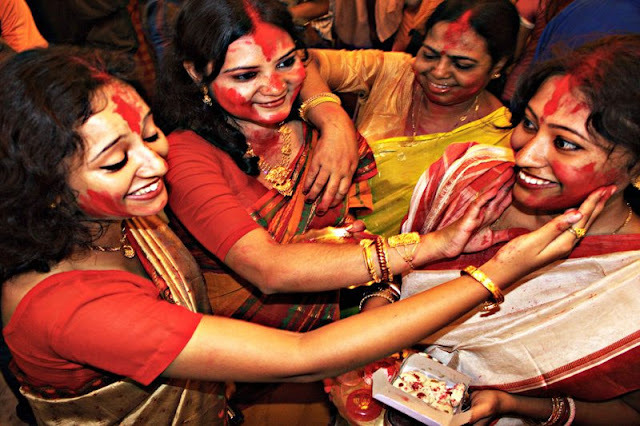 The women dress up in red and white sarees ( in Bengali its called lal par shada saree) and offer the last puja to the goddess. After offering puja and bidding adieu they play with Vermillion and it's a mini holi which they play with vermillion ( sindoor). It's worth watching as the beautiful women of Bengal get smeared with vermillion. Head to Bagbazar Sarbojonin which is famous for the sindoor khela and women from across Kolkata especially come here to offer puja to the goddess and play with sindoor (vermillion).You need to reach before 10 am to watch the same. Bagbazar Sarbojonin is in North Kolkata. If you are taking a cab tell the driver you want to go there and it's tough to find a driver who doesn't know this place. If you are taking a metro you can get down at Sovabazar Metro Station and then walk for approximately 1.1 Km to reach Bagbazar Sarbojanin Durgotsav. Ask any Bengali and s/he would definitely say this is the saddest part of entire Durga puja. During the immersion, you can see tears in the eyes of many people. 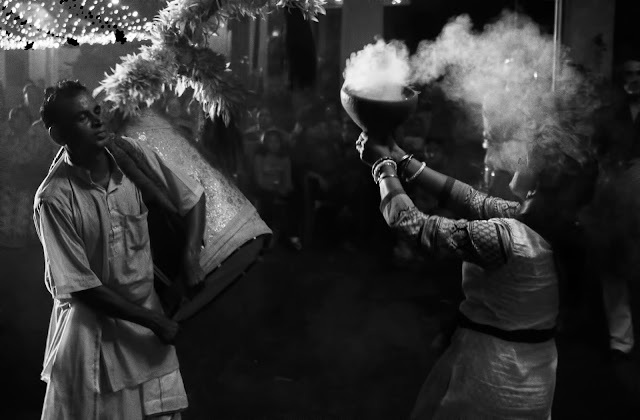 During the immersion, people dance, play dhaak , dance with dhuanchi and all crazy things. The procession starts at around 6 pm and ends well past midnight. The Durga idols are taken in the trucks to various ghats of Ganges and are immersed there. 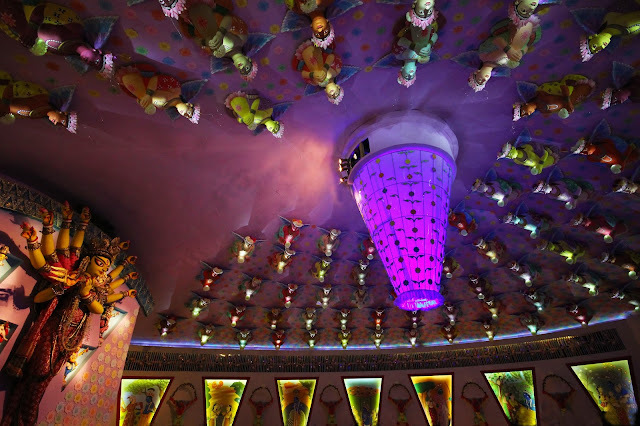 Head to Babughat to see the immersion in process. Alternatively, the best way to enjoy the immersion is to book one of the immersion cruises from West Bengal tourism.